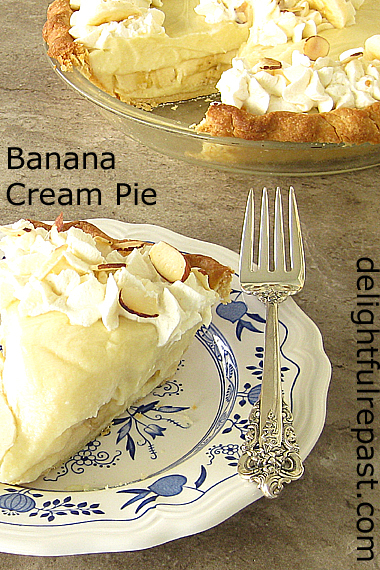 Banana cream pie is one of my lifelong favorites, enjoyed often at my Southern grandmother’s house. She made it with a regular flaky pie crust, but lately I’ve taken to making it with a slightly sweet, vanilla scented shortcrust pastry I came up with to hint at the vanilla wafers in a traditional Banana Pudding. This pastry is going to be my go-to crust for any cream pie from now on, including Coconut Cream Pie and Chocolate Cream Pie. It rolls out beautifully and has a wonderful flavor and texture. The custard is thick and lovely, quite a nice color, no need for the yellow food coloring some people add. This Banana Cream Pie is what the word luscious was invented for! What is your favorite pie? I’m really more of a fruit pie fan, though I’ve been on a custard pie kick lately. But I promise, I'll post something besides pie next week! 1 Add flour, powdered sugar and salt to work bowl of food processor; turn on for about 3 or 4 seconds to combine. Add chunks of butter; pulse to a crumb texture, leaving some visible chunks of butter. Add egg and vanilla extract; pulse until the dough starts clumping together. This is to be a crisp, more cookie-like crust, rather than a flaky pastry; so there's not quite the concern about over-processing. Flatten slightly into a 4- to 6-inch round disc, wrap in square of plastic wrap and refrigerate for 30 to 60 minutes. Save the piece of plastic, you'll be using it again. 2 Very lightly butter a 9-inch glass pie plate; I usually just run the butter wrapper over it. On a lightly floured piece of parchment, roll out disk to a 13-inch circle about 1/8 inch thick. Place pastry in pie plate, being careful to not stretch the dough. Leave a 1-inch overhang of dough*. Crimp and flute the edge. (Sometimes you need to chill the pastry a bit before crimping.) Cover loosely with the reserved piece of plastic wrap and place in freezer for 15 minutes. Preheat oven to 425F/220C/Gas7. * Don't throw away the scraps; they make wonderful cookies (I made 6 little 2-inch wafers, using ever scrap). Just press them out and throw them on the baking sheet next to the pie plate for the final 10 minutes of baking. 3 Fit a square of aluminum foil in the shell and fill with ceramic pie weights (baking beans). Set on a rimmed baking sheet (to catch butter drips). Bake the thoroughly chilled crust for 20 minutes, then remove the foil and pie weights, pop on the pie crust shield and bake for another 10 minutes. Note: I use two boxes of the ceramic pie weights, and they just fit nicely into a 200-gram tea tin. If you're not a loose leaf tea drinker, though, a quart canning jar works. 4 Remove fully pre-baked pie shell from the oven; let cool completely before filling, at least 30 minutes or hours ahead, whatever suits your schedule. 5 Make filling while pie shell is cooling. In heavy-bottomed 2-quart saucier or 2- to 3-quart saucepan, heat milk just to a simmer. 6 In 2-quart glass measure or bowl, whisk together sugar, flour and salt. Whisk in eggs until thoroughly combined. Gradually add hot milk, whisking constantly. 7 Pour mixture back into saucier and cook over medium-low heat, whisking constantly until thickened—just takes a couple minutes (well, several, but not as many as when starting with unheated milk), so don't get distracted—you don’t want scrambled eggs. (Food safety note: Any mixture with eggs should be cooked until it registers 160F/72C on instant-read thermometer.) Custard should be very thick, with the whisk leaving trails. 8 Remove from heat. Whisk in cold butter and vanilla extract (and brandy or rum, if using) until butter is completely melted. Let cool at room temperature for 20 minutes, whisking occasionally, before pouring into pie shell. Spread 1 cup of custard across bottom of pie shell. Cut bananas into slices about 3/8 inch (1 cm) thick. Arrange the banana slices. Pour on and smooth out the remaining filling, pressing down to make sure all the spaces are filled. 9 Cover and refrigerate pie for at least 5 hours or up to 24 hours before piping on whipped cream. Garnish with fresh banana slices, banana chips or toasted sliced almonds. I used 2 tablespoons (0.5 ounce/14 grams) sliced almonds, toasted in small dry skillet. Sully, I'm not surprised, as they do get lumped together as half-sibs! Don't worry, I'll get around to posting lemon meringue pie one of these days, but I have to give pies a rest for a while on the blog. Jean, your pie looks dreamy! Banana Cream is another pie I used to make all the time but I admit, I haven't made one in ages. Your crust sounds absolutely perfect! I will have to try this one. Although my Christmas dinner menu is already planned, in the new year is a wonderful time to try something new. Thanks for sharing. Sandi, thank you so much. You're right, now is not the time to try something new; wait until the new year. Be sure to let me know how it turned out for you and what you thought of the crust. Lovely pie and that pastry sounds like an absolute delight. I'm currently banned from making pies because I get carried away and make far too many, especially at this time of year. I'll remember this recipe in case the ban's lifted after Christmas. Despite the ban I do slip away to secretly get myself the occasional (very occasional) pastel de nata but don't tell anybody. Can't remember when I last had a bite of banana cream pie. The crust looks really great, Jean. Thanks, Angie! It just might be my favorite pie, other than fruit pies. First coconut and now bananas. You're hitting all my favourite fruits, Jean! Some of mine as well, Margie! Either one goes well with a nice cuppa tea! Having said that this does look delicious. Many thanks for sharing your recipes. Thanks, Jan! It's funny, my husband doesn't like either coconut or bananas, but he LOVES my coconut pie and banana pie! I'm ready to make a chocolate pie from your recipe! The crust looks "doable", which most recipes aren't. This sounds delicious, Jean. I was reading your introduction, carefully. "lately I’ve taken to making it with a slightly sweet, vanilla scented shortcrust pastry I came up with to hint at the vanilla wafers in a traditional Banana Pudding." It occurred to me you are doing with your recipes and ingredients what a good poet or novelist does with words, create a work of intelligent ideas and emotional experiences for all the senses. You are an artist!! Good one. Looks good, even for this chocoholic! Thanks so much Jean for partying with us at the #WednesdayAIMLinkParty and Giveaway! We hope to see you at our next party on Dec-19-2018. Thanks, S (At Rivercrest Cottage), it really is doable! I think that chocolate cream pie recipe is for the small 6.5-inch pie, so you would have enough of this crust for two pie shells. Or just double the chocolate filling recipe and make a 9-inch. Tony, thank you so much. Your comment just made my day. There is a lot of emotion in my food, though I hadn't exactly thought of it that way until I read your kind words. Thanks, Dee. And chocoholics can always paint the crust with a bit of melted chocolate and let it harden before putting in the custard and bananas. Thanks, Lea Ann. When you get around to making banana cream pie (so many foods, so little time! ), I hope it will be this one! Looks amazing, Jean. Thanks so much for sharing. Thank you, Amalia. I wanted to make another one today, but it will have to wait a day or two. The shortbread crust sounds amazing, Jean, and I look forward to trying your recipe. I just made shortbread spritz with my four year old granddaughter. I think you'd like them because they're not too sweet. happy baking! Hello, Jean, I just found your comment that you left on my blog about this time last year! I don't know how I lost my comments, but I'm really enjoying them now - like a found box of letters. Your banana cream pie sounds like heaven. My Grandmother seemed to favour cherry pies and peach cobblers, with the latticed tops. I never was one for pies as a child, but I loved the pastry. She once let me eat the pastry edge off of one her freshly baked pies, I remember it as one of the biggest and best proofs she loved me (she was a little scary in other ways). I always did love vanilla and butterscotch pudding and whipped cream as a kid. I had to come to Britain to discover actual custard. My favourite pie for most of my life was apple pie with whipped cream (I never understood why some people wanted to put cheese with one). I felt my waist line expand just reading your post! Thanks for visiting my blog. Kitty, thank you. So you're bringing another grand into the kitchen--how fun! And you've reminded me it's been far too long (as in decades!) since I've made spritz cookies. Shelley, how lovely to hear from you! Glad you finally found the "box of letters" that was lost in space! I don't understand that apple pie with cheese thing either--I've never known anyone who actually eats it. I don't need to have anything at all with my apple pie, though if I have some custard sauce on hand, that's nice. Oh what a lovely Banana Cream Pie, Jean! It looks gorgeous and sounds so good. Sharing around, including on the Hearth and Soul Facebook page. Thank you for sharing, and for being a part of the Hearth and Soul Link Party. Hope you are having a lovely weekend! Well, Jean, I've never made a banana cream pie, and like Sully, I am a lemon meringue pie lover. But I have to tell you your crust tipped my palate. 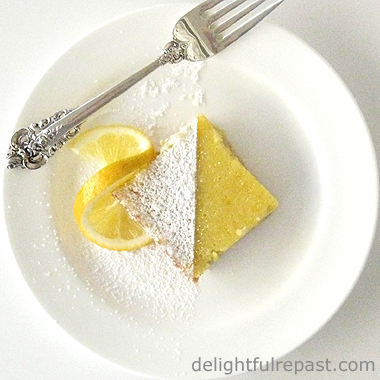 I am a shortbread cookie lover and this crust is just the thing to add that certain something. Also, your custard and whipped cream garnish are forcing my hand to make it. I just asked my hubby if he likes banana cream pie and he said he was indifferent to it. I'm going to step past his indifference and make your recipe as I think it will knock his socks off! BTW I just might have to break down and get some pie weights....you know me...always approximating what I need to do. Thanks for your tasty tips! Thank you, April. It is a delicious pie, and I wish I had a piece right now. Thank you for sharing it around. "See" you soon! Sue, thank you so much. I do hope it will knock his (and your) socks off. 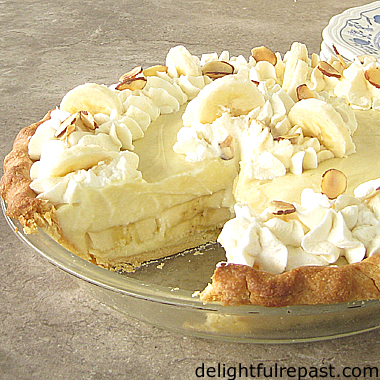 My husband has always said he doesn't like banana cream pie or bananas, and he absolutely loves this pie. Let me know how Mr M liked it! Love your recipe for banana cream pie, Jean! Looks perfect and delicious!! Thank you, Marcelle. We love it and I hope you will too! Wow - both my favorite cream pies in a row! I try to avoid making them - because I would eat the whole thing! (But I will someday!) I love the crust recipe - can’t wiat to try that, too! Banana Cream Pie is one of my favorites, this looks so good, yummy! Hope you are enjoying your week and thanks so much for sharing with us at Full Plate Thursday! Thanks so much, Miz Helen! It's a good old-fashioned Southern banana cream pie, just like my Grandma made. That pie is so inviting! I'm very sure it just melts in your mouth. I like that idea for the crust, too. Hope your week is Merry and Bright! Ellen, thank you. It is my favorite pie--until peach season, that is! Happy December! I know someone in my house that would eat more than his share of this delicious looking pie. Have a fun week. Your pie looks incredible delicious. Have a great week. Thank you, Gerlinde. Have a delicious week! This sounds delicious! Thanks for sharing at the Sew It Cook It Craft It link party. You're one of my features today! Thank you so much, Lina! I'll check out your features now! You've been on a pie roll! And why not? Pie is great stuff. Haven't had banana cream in ages, either. Now that I think about it, I haven't had any kind of cream pie lately! I'm more of a fruit pie person, too, but I won't turn down a slice -- or two -- of ANY kind of pie. :-) This crust looks great too, BTW. Thanks! Aaww, thanks, Mum! It's a fun one to make! Thanks, John! This one is really worth breaking out of our fruit pie rut for! Looks AMAZING! Thanks for sharing with us at the To Grandma's house we go link party, see you next week! 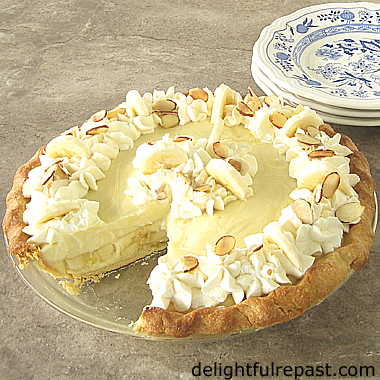 Oh, banana cream pie, my all time favorite custard pie! Company is coming and although I'll probably make a chocolate soufflé at some point, I'll certainly need more goodies. But I think I should also make the coconut cream pie along with this one. That's what my grandmother use to do when I'd come visit. Richard, that sounds delightful! I like the way your grandmother operated! I've been getting in the mood for a soufflé, too, but I'll probably make lemon.